The Financial Post reports that China will drive commodities super-cycle. 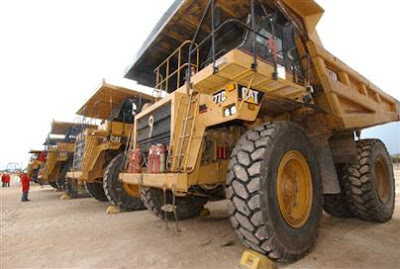 Canwest News ServiceHeavy equipment at McClean Lake uranium mine in Northern Saskatchewan. Driven by record levels of imports into China, Scotiabank's commodity-price index climbed 2.2% in May from April. OTTAWA - Canada's key commodities have reversed their dramatic declines and are headed for years of renewed strength as the Chinese "dragon" rekindles an Asian-led super-cycle in basic materials, says Scotiabank commodities expert Patricia Mohr. Driven by record levels of imports into China, Scotiabank's commodity-price index climbed 2.2% in May from April, the month in which the 45% slide from July 2008 peaks came to an end, according to Ms. Mohr. "China's dragon has breathed life back into commodity prices," Ms. Mohr said. Moreover, China's economy is prospering despite weakness in the G7 countries that constitute the Western world's industrial powers, she said. "If you look at what has happened in terms of China's industrial activity in the past three months (up 8.9% year-over-year in May alone) it obviously has at least partly decoupled from the G7." Though the notion of decoupling, in which Asian economies prosper irrespective of Western growth, fell out of favour in last year's sell-off, as did a commodities "super-cycle," extending over many years and caused by a structural change in the world's economy, Ms. Mohr is convinced they will be the prevailing trends for years to come. Theage.com reports that China's manufacturing expands for 4th month. China's manufacturing expanded for a fourth month as a 4 trillion yuan ($719 billion) stimulus plan and record bank lending revive the world's third-largest economy. The official Purchasing Managers' Index rose to a seasonally adjusted 53.2 in June from 53.1 in May, the Federation of Logistics and Purchasing said today in Beijing in an e-mailed statement. A reading above 50 indicates an expansion. In China, the stimulus plan and new loans of 5.84 trillion yuan in the first five months, almost triple lending a year earlier, are driving growth. ``China's stimulus program is having a demonstrable effect on domestic spending, which has resulted in increased manufacturing activity,'' said Jing Ulrich, Hong Kong- based chairwoman of China equities at JPMorgan Chase & Co.
Bank of America Merrill Lynch and JPMorgan raised this week their forecasts for second-quarter economic growth. The former expects 7.6 per cent, compared with 7.2 per cent previously. JPMorgan increased its forecast to 6.9 percent from 6 per cent. Prices of copper, used for autos and construction, are headed for their biggest six-month gain in 22 years as Chinese buyers boost imports to records to replenish stockpiles. Higher coking coal prices are adding to evidence that demand for steel is recovering. Fushan International Energy Group Ltd., a producer of steelmaking coal, said last month that it raised prices for the first time since January. China's lending boom sparked a 32.9 percent surge in urban fixed-asset investment in the first five months, the fastest growth in five years. New loans in June may exceed 1 trillion yuan, triple lending in the same month a year earlier, China Business News reported June 30. The Star Phoenix reports that Chinese demand forecast to boost oil price. Scotiabank's commodities arm is forecasting $90 oil in 2010, based partly on China's intention to build stockpiles of the commodity during the next several years. 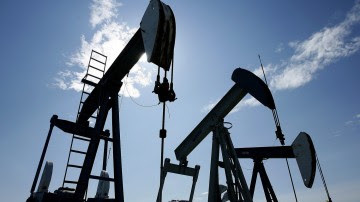 Scotiabank has revised its forecast from last month's target of $75 US per barrel West Texas Intermediate (WTI), and slightly increased this year's oil price projection to $63 from $58 US. "It has to do with organic growth for petroleum in China, but also other emerging markets like India and Brazil," Patricia Mohr, Scotiabank commodities expert and vice-president of economics, said in an interview. "I do think China will buil d stockpiles . . . it won't be a near term kind of gain. It's something that will be with us for a while." China has completed construction of its Phase 1 tank farm, and appears to have five huge storage facilities along the coast, said Mohr. China completed filling that farm by late last year, but a second phase of storage is just starting construction. The massive nation will also build underground aquifers to store crude, and will start constructing those this year. Next year they will begin the filling of those storage units, and then begin a third phase, said Mohr. These developments contributed to Mohr's more bullish price forecast, as well as the fact that China's oil consumption jumped six per cent last month. In addition, China imported 57 per cent of its oil demand as of May. "That is now higher than the U.S. dependency," said Mohr. "The U.S. is going down." The U.S. wants to move away from imported oil and has various policies in place to allow for that, including the production of corn-based ethanol, said Mohr. "The real growth story for petroleum is going to be China, and then India, Brazil, Malaysia, Vietnam . . . the emerging markets." The Globe and Mail reports that China leading recovery in oil demand. "I don't think the market has recognized the importance of China's role in raising prices in recent months." China's appetite for foreign oil has surpassed that of the United States, according to the Bank of Nova Scotia, as consumers race to the pumps to fill their new cars and the country feverishly builds storage facilities to take advantage of weak markets. In its monthly commodity update, market specialist Patricia Mohr said China relied on imports for 57 per cent of its petroleum production, while the United States imported 55 per cent of its needs. China's import dependency was less than 40 per cent in 2003, and averaged 50 per cent in 2008. "It's an interesting question for Canada's oil sands if growth is coming from emerging markets rather than the G7," she said. "Our efforts are on serving the U.S. market, but I think commercially it would be in our interests to diversify. The world has changed substantially and will change more as we move into the next decade." The Wall Street Journal reports that iron-ore producers boost output as Chinese demand rises. LONDON -- At least two more iron-ore producers announced output increases this month, underscoring how signs of strong Chinese demand for the raw material are spilling across the industry and pushing spot-metal prices higher. It is a sharp reversal from last year, when Western companies curtailed mining for iron ore, a vital ingredient for making steel, as the global economy slowed, steel demand all but collapsed and spot iron-ore prices sank. Chinese demand for iron ore seems to be picking up. Here, a steel and iron factory in Shanxi province in March. Reuters reports that China mid-June steel output hits 2009 high. BEIJING, July 2 (Reuters) - China's steel output hit 1.522 million tonnes per day in June 11-20, the highest daily output this year, according to data from the China Iron & Steel Association obtained by Reuters on Thursday. 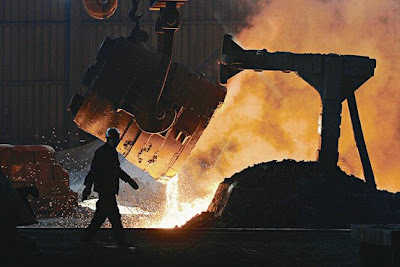 The rate of output is equivalent to an annual production of 555.5 million tonnes, more than 10 percent above 2008 output of 500 million tonnes, and sets a pace that could leave June close to the all-time record for monthly steel production. The accelerating rate of steel production will further weaken the case for a 40 percent cut in annual iron ore prices that CISA is demanding in talks with top mining firms, which have run past a June 30 deadline without agreement. CISA wants Rio Tinto (RIO.AX: Quote, Profile, Research, Stock Buzz), BHP Billiton (BHP.AX: Quote, Profile, Research, Stock Buzz) and Vale (VALE5.SA: Quote, Profile, Research, Stock Buzz), the companies that control most of the global iron ore trade, to cut prices back to 2007 levels, which would mean a deeper cut in 2009 prices than many other steel mills have accepted. Despite a slump on the global steel market, China's steel production has rebounded strongly this year after a slump at the end of 2008, spurred by a 4 trillion yuan ($586 billion) state stimulus plan. Marketwatch reports that China reportedly to concede on iron-ore pricing. SAN FRANCISCO (MarketWatch) -- The China Iron & Steel Association has backed down from its hard line on iron-ore prices and is prepared to discuss a less-than-hoped-for 33% reduction on benchmark ore this year, according to reports Thursday. Last month, Australian iron ore exporter Rio Tinto Plc. /quotes/comstock/13*!rtp/quotes/nls/rtpand Japan's Nippon Steel /quotes/comstock/!5401had established a deal cutting iron ore prices by 33%, effectively establishing a benchmark. But Chinese steel mills including Baoshan Iron & Steel /quotes/comstock/28c!e:600019resisted, instead aiming for price reductions of 40% or more. CISA, a group that includes the country's major steel mills, had also initially resisted the price cut, demanding cuts of 40% to 45%, according to a report in the Australian. However, "Rising demand for imported iron ore in China has undermined CISA's efforts to strike a hard bargain," the Australian reported. CISA represents the 72 main steelmakers in the country, who together account for up to 75% of Chinese production. The Financial Times reports that steel demand helps nickel extend its rally. Nickel prices on Wednesday hit their highest level in nine months, extending the metals 65 per cent rally in the second quarter of the year. This came amid signs of a recovery in stainless steel production, in which the base metal is a key ingredient. The rise in nickel prices between April and June dwarfs the increases of other base metals, including copper — 27 per cent — and aluminium — 13 per cent. On the London Metal Exchange, nickel prices for delivery in three months surged above $16,500 a tonne, up more than 6.5 per cent on the day and the highest level since late-September. But prices are well below the all-time high of more than $50,000 a tonne set in May 2007. Analysts justified the rally on increasing demand for stainless steel — which accounts for 70 per cent of nickel consumption, according to Deutsche Bank — as consumers are restocking. Barclays Capital noted that nickel imports in China have risen, hitting a record high in May, while mine output has declined 21 per cent so far this year when compared with 2008.
forbes reports that China May copper imports hit record for 4th month. HONG KONG, June 11 (Reuters) - China's May imports of unwrought copper and semi-finished copper products hit a fresh high for the fourth straight month on continued arbitrage trade, though domestic consumption waned ahead of low seasonal demand in the summer. Imports of unwrought aluminium and semi-finished aluminium products in May dropped 24.6 percent on the month due to reduced arrivals of booked arbitrage imports for primary aluminium after record inflows in April. China, the world's top consumer of copper and aluminium, imported 422,666 tonnes of unwrought copper, including anode, refined and alloy, and semi-finished products, in May, up 5.7 percent from April's record 399,833 tonnes, data from the General Administration of Customs showed on Thursday. Based on April's ratio of primary aluminium to total imports, May's data could show primary aluminium imports of 273,354 tonnes, down from April's record 362,400 tonnes. Traders had expected primary aluminium imports of 200,000-250,000 tonnes in May. Data on primary metal, an indication of Chinese consumption, will be released in late June. But Chinese buyers have increased orders for spot imports of primary aluminium over the past two weeks, which could boost imports in June, traders and smelter officials said. 'May's arrivals were mostly previous months' orders. But Chinese orders are rising again as domestic prices rise,' said an aluminium trader, who expected June's imports to hit 300,000 tonnes. Canada.com reports about Canadian efforts to introduce the growing Chinese middle class to Canadian-style wood-frame homes. 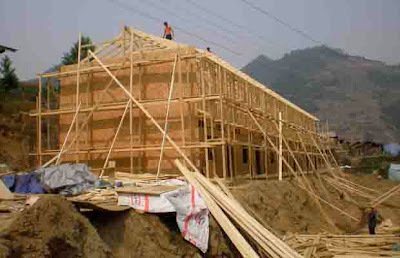 A file picture of Chinese housing construction using B.C. lumber, as part of a Canadian effort to introduce the growing Chinese middle class to Canadian-style wood-frame homes. Vancouver Island carpenter Steve Ross moved to China two years ago as part of a Canadian effort to introduce the growing Chinese middle class to Canadian-style wood-frame homes. But it's not in the sophisticated setting of Shanghai — where North American-style villas are a sign of status — that he's making a mark. Instead, he's in mountainous Sichuan, a rural and mostly poor province where five million people were left homeless following a deadly earthquake on May 12, 2008. And he's not building villas for the rich. He and a handful of other Canadians are building small, affordable houses, made from British Columbia lumber, in the county of Qingchuan, where their work has been getting a lot of attention from the Chinese news media. Ross isn't attracting attention just because he's a foreigner who is helping rebuild after the disastrous 2008 earthquake. It's the type of house he and three other Canadian colleagues are building. Chinese normally do not build with wood. They prefer concrete or brick. But wood-frame houses are more earthquake resistant than brick, an obvious bonus in the minds of the residents of Qingchuan, as well as in faraway Beijing, where they remember the quake that left 90,000 people dead. The Canadians have been interviewed by Chinese reporters more than 20 times, and this spring Ross was introduced to 250 million Chinese television viewers as "Steve, the foreign carpenter," on China's CCTV news where he and Canada's wood-building expertise were showcased. It's the kind of attention that Ross — director of training for Canada Wood, which is spearheading the wood-construction drive in China — hopes will lead to a breakthrough. China needs new houses. And Canada needs to sell lumber. B.C. in particular has been working for most of this decade on introducing wood-frame housing to China. Successes so far, it's fair to say, have been zip. Now, for the first time ever, B.C. lumber sales to China are rivalling those to Japan, even surpassing Japan in February and March. While only a tiny percentage of the wood is going into housing, it's raising hopes on this side of the Pacific that China may one day be a major lumber market. Ross believes the switch to low-cost housing in the earthquake zone, funded by an $8-million package from the B.C. and Canadian governments, is a factor in China's new interest in B.C. wood. "We are slowly seeing an actual market develop," Ross said from Shanghai, where he had returned for a few days. "When the locals see a wood-frame house, they recognize that it looks very stable in terms of earthquake resistance. The builders have noticed that and they want to grasp something new. And because it's relatively affordable they figure they can make a go of it as a new building system." And with North American lumber prices near record lows, Canadian wood-framed houses, complete with insulation, vapour-barriers and waterproofing technologies, are all of a sudden an affordable alternative to brick and stone. Ross trained local builders in the techniques of wood-frame construction and has overseen the construction of three demonstration homes. Other Canadians are building apartment complexes, a school, a special education centre and a home for the elderly. Further, another 60 single-family and multi-family homes are under construction by the local builders to be sold to local residents. Contracts have been signed for 150 new homes. However, low lumber prices are stimulating more than just sales in the earthquake zone. "When you talk to lumber producers in B.C., which we do on a regular basis, there is definitely something happening out there in terms of an accelerated uptick in consumption of wood," said Paul Newman, managing director of Canada Wood. "It's hard to see the Chinese lumber market ever rivalling the North American market. But to see it rivalling Japan is really shaking people up." Prince George Citizen reports that lumber exports to China still rising. As B.C. 's lumber exports continue to climb in China, Forests Minister Pat Bell believes they may even eclipse shipments to Japan this year. While the 714 million board feet of lumber shipped to China in 2008 did not meet Bell's hopeful forecast last year of one billion board feet, it continued a trend of several consecutive yearly increases. With another 413 million board feet already shipped to China this year, Bell believes his ambitious target of of seeing four billion board feet of the province's lumber in China by 2011 is not out of reach. "When I first set a goal of delivering four billion board feet by 2011, everybody kind of looked at me like I was kind of crazy," said Bell on Tuesday. "It's not looking so unrealistic anymore. If we can get to a billion and a half this year, by 2010, 2.5 billion is not unrealistic, which would have us right on target for four billion by 2011." Bell even believes the volume of lumber shipments to China in 2009 could exceed that to Japan, traditionally B.C. 's No. 2 market. It's unlikely the dollar value of shipments to China will surpass that to Japan, as Japan is a market for high-end lumber. For example, the dollar value of shipments to Japan in 2008 was $719 million, while the value of shipments to China was $177 million. The U.S. remains the No. 1 market for B.C. lumber, accounting in 2008 for $2.2 billion in sales, a 61-per-cent dollar share of the B.C. export market. Expanding markets into China has been part of a long-term course Bell has charted as forests minister in the past year. Also on the list are better utilizing timber to foster a bioenergy sector, using more wood in commercial construction and growing better trees faster. While analysts have pointed out that increases into China have been incremental and largely based on low-grade lumber, Bell argues the province's industry is finally having success selling higher-grade lumber in targeted areas. One example has been B.C. 's success at modelling wood trusses for use in the numerous multi-source apartment blocks in China. The province used a demonstration project in Shanghai last year to prove lumber suitability and cost competitiveness. FXstreet reports that China may sugar imports up 26% on year to 141,457 tons. BEIJING (Dow Jones)--China's sugar imports in May rose 26% on year to 141,457 metric tons, the General Administration of Customs said Monday. In the January-May period, sugar imports rose 66% to 639,459 tons. Stormx reports that grain prices respond to China and the dollar. For this month's commentary we will focus on those fundamentals which continue to fuel the surge in prices: tight supply and stable demand, China's strategic stockpiling, and the recent weakening of the U.S. dollar. China's demand has been a key driver of U.S. soybeans prices this year; first quarter imports alone were up an incredible 31% from the same period in 2008. Through the government's grain reserve agency, Sinograin, the Chinese have implemented a strategic stockpiling campaign, whereby the government has been purchasing domestic soybeans since December 2008 at prices above prevailing market rates in an effort to support farmers' income. Sinograin has since committed to purchasing 40 million tonnes of corn and 7.25 million tonnes of soybeans for strategic reserves. To put these volumes in perspective, those 40 million tonnes of corn represent roughly 25% of China's total annual production. While recent reports suggest that current storage is reaching full capacity, the government has now announced that it plans to construct additional storage facilities this year with capacity of another 15 million tonnes of grain. The government's stockpiling program has created the current market dynamic where local Chinese prices are being maintained at higher levels than international prices. This condition has played a major role in the higher soybeans imports noted earlier, and a similar dynamic is developing for China's domestic corn and wheat markets. This month China publicly confirmed that their purchasing campaign will indeed now spread to corn and wheat this year. The National Development and Reform Commission has just announced that the 2009 wheat purchase program will begin by the end of May, and will serve the same purpose to support local prices should they fall below pre-defined thresholds. As remarkable as these purchase volumes have been, the government's announcement of further storage construction erases any doubt that China's grain demand will continue in the near term. For the longer term outlook however, we must remain cognizant that many factors which have supported higher soybeans prices have been "one-time" in nature and may abate next year. The Argentinean farmers' strike, historic droughts in both Argentina and Brazil, and the strength of the Brazilian Real in late 2008/early 2009 were all major factors this year that may not be part of the equation for the 2009/2010 marketing season. My reaction: The Chinese dragon has breathed life back into commodity prices. 1) China's recovery is gathering further momentum. 2) The stimulus plan and new loans of 5.84 trillion yuan in the first five months, almost triple lending a year earlier, are driving growth. 3) New loans in June may exceed 1 trillion yuan, triple lending in the same month a year earlier. 4) China obviously has at least partly decoupled from the G7. 5) China's oil consumption jumped six per cent last month. 6) China imported 57 per cent of its oil demand as of May. That is now higher than the US dependency on foreign oil. 7) China will also build underground aquifers to store crude, and will start constructing those this year. Next year they will begin the filling of those storage units. 8) Strong Chinese demand for the raw material are spilling across the industry and pushing spot-metal prices higher. 9) Prices of copper, used for autos and construction, are headed for their biggest six-month gain in 22 years as Chinese buyers boost imports to records to replenish stockpiles. 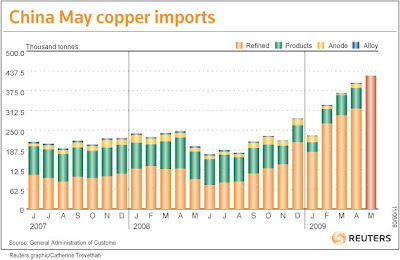 10) China's May imports of copper products hit a fresh high for the fourth straight month. China imported 422,666 tonnes of unwrought copper, very strong numbers even by Chinese standards. 12) The China Iron & Steel Association (CISA) has backed down from its hard line on iron-ore prices after rising demand for imported iron ore in China undermined its position. 13) Nickel prices on Wednesday hit their highest level in nine months, and nickel imports in China have risen, hitting a record high in May. 14) Something is happening in China in terms of an accelerated uptick in consumption of wood. B.C. 's lumber exports to China continue to climb. 15) China's sugar imports in May rose 26% on year to 141,457 metric tons, and, in the January-May period, sugar imports rose 66% to 639,459 tons. 16) China's demand has been a key driver of U.S. soybeans prices this year. First quarter imports alone were up an incredible 31% from the same period in 2008. 17) This month China publicly confirmed that their purchasing campaign will indeed now spread to corn and wheat this year. Conclusion: This is exactly what I predicted in *****Hyperinflation will begin in China and destroy the dollar*****. Chinese efforts to boost domestic consumption while maintaining its dollar peg is creating massive demand for raw materials, driving up prices. Eventually Chinese demand will drive up commodity prices to an extent which forces it to drop the dollar to contain domestic inflation. Judging by its incredible levels of commodity imports, this event will happen in the very near future. This entry was posted in China, Currency_Collapse, Food_Crisis, News_Developments. Bookmark the permalink. China is already trying to bash down the private commodity speculation in their economy. And they already seem to stop bolstering their strategic reserves due to high prices -- at least regarding to oil. Example: they bought cotton at low prices and then sold it locally to support their cotton industry. They won't waste their reserves by buying too expensive commodities. And the high oil price will continue to push down the global industrial economy. They know that. Eric , what do you think about Fekete deflationary opinion ?